With Ryan Madson’s activation from the DL, Trevor Gott got the short end of the stick and was sent back to the minors. The Nationals are due to get the cavalry back from the DL very shortly and will activate a number of important, formerly injured players. With all these players to add back to the roster, who should get the ax to make room? 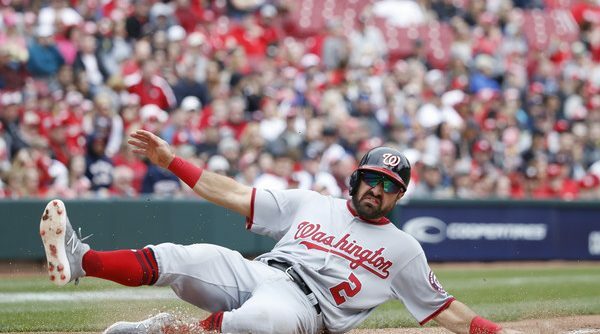 The players believed to be returning soon are Brian Goodwin, Daniel Murphy, Matt Grace, and Adam Eaton. That means two outfielders, an infielder, and a reliever should be sent back to the minors. There are a number of relievers the Nats can choose from, the most likely candidates being Tim Collins, Justin Miller, and Wander Suero. The Nats can go a few different ways with this decision, depending on how they want to balance the bullpen. Grace is a lefty, and Collins is the only one out of that selected group who is left-handed, so that would be a natural replacement. He has, however, been effective in his limited appearances this season. In 2.2 innings over 5 games, he struck out three batters, walked one, and allowed zero runs. He has also had a few Tommy Johns, which could be a factor in his workload down the stretch. Justin Miller is a relatively under-the-radar pitcher who could easily be sent down, but he’s also performed well in a limited amount of time. In 2.1 innings over 3 games, he struck out five, walked none, and given up zero runs. There’s a lot unknown about him, but if you look at his numbers, his career ERA is 4.86, so that could be a reason for demotion. It has also been two years since he’s pitched in the big leagues, and he could be turning a new leaf. We just don’t know. Wander Suero is the youngest of the three, and perhaps has the biggest upside. Unlike Collins and Miller, this is his first go-around in the bigs, and there is a lot of potential for him to grow. On the flip side, maybe it means he needs more seasoning in the minors. He has pitched pretty well in the big leagues. In 10 games, he has a 2.70 ERA with 8 strikeouts, 4 walks, and a WHIP of 1.30. Pretty solid, especially for a player of his age. Suero would probably not be my pick to take off the roster, but he’s on the list. Admittedly, I don’t know anything about contract situations and who has an option so this decision could be taken out of their hands due to that. The easiest decision to make is in the infield: when Daniel Murphy comes back, Adrian Sanchez leaves. I like him and he’s a great guy to have on the bench, but there’s no question here. The rest of your infield roster consists of Matt Adams, Wilmer Difo, Anthony Rendon, Matt Reynolds, and Trea Turner. Sanchez plays the middle infield and third, he’s the natural person for Murphy to replace, and that’s what’s going to happen. Murphy will slide back into the lineup, probably splitting some time with Difo as he gets back into game shape. See you next infield injury or for September call-ups, Adrian. The outfield is sticky. On the one hand, the first decision is quite easy. No matter whether Goodwin or Eaton comes back first, they’re booting Andrew Stevenson back to the minors. He’s a good kid, but there’s just no room for him. And when the second guy comes back…the Nats are probably going to have to send Juan Soto back to the minors. Soto has been superb, and he’s really provided a spark, but he’s young, and, like with Stevenson, there’s just not enough room in the outfield. His call-up was completely unexpected anyway, and he’ll tear up the minors and become even better. I don’t like it, but it’s what I see has to happen. The silver lining is that if he’s in the minors, it means Eaton is back and healthy, and Spanky is perfectly capable of setting the table and providing a much-needed spark in the lineup. It’s going to be difficult to say goodbye to some of these guys, as they’ve done yeoman’s work while the regulars had the plague, but this team is getting close to being healthy, and they’re finally going to be in top condition and ready to explode. Do the Nationals Have a Pitching Depth Problem? 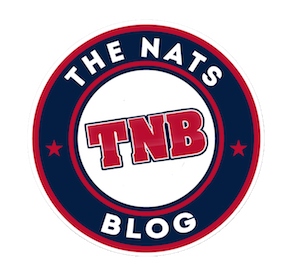 Last Tuesday I discussed the state of the Nationals offensive depth, and what it could mean for the rest of the season. While I said I would write a follow up discussing the pitchers in a couple days, work and life got in the way (as they do) and I’m getting this to you a little late, so I apologize for that. 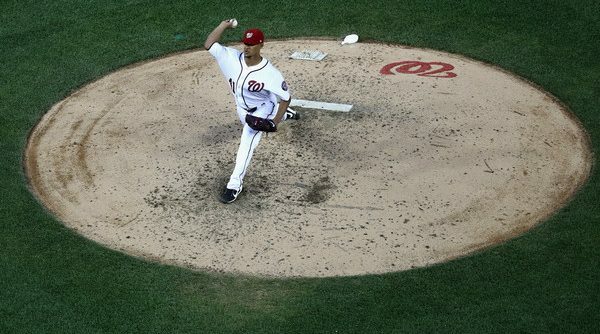 Without further ado, let’s take a closer look at the Nationals pitching depth. Continue Reading Do the Nationals Have a Pitching Depth Problem?